A truly unforgettable story is defined by its characters. Their motivations, their changes, their actions compel us to read on, anxiously trying to discern what will happen next. 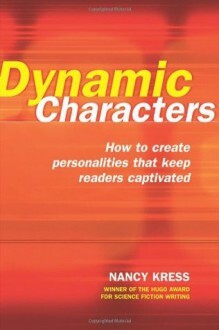 In Dynamic Characters, award-winning author and Writer's Digest columnist Nancy Kress explores the fundamental relationship between characterization and plot, illustrating how vibrant, well-constructed characters act as the driving force behind an exceptional story. Kress balances her writing instruction with hands-on checklists to help you build strong characters from the outside in. Blending physical, emotional and mental characterization, you'll learn to create characters that initiate exciting action, react to tense situations, make physical and emotional transformations, and power the plot from beginning to end. Fantastic book on the art of creating a character. Kress stops at nothing to give you helpful and insightful tips on how to breathe life into your characters. Has the most complete character survey I have ever encountered. Definitely a must for any writer!